Last Saturday we officially kicked off Community Studio Saturdays at the Empower Youth Ranch (2800 State Rt. 125, Bethel, OH 45106). Although it was a dreary day, we stayed in the comfort of the Barn Studio and talked about field drawings and The Drawing Center’s recent exhibition: Exploratory Works: Drawings from the Department of Tropical Research Field Expeditions. To learn more about this lesson and to view examples of the kinds of projects we make in Community Studios, check out our most recent blog post: Community Studios: Week 4 Highlights. 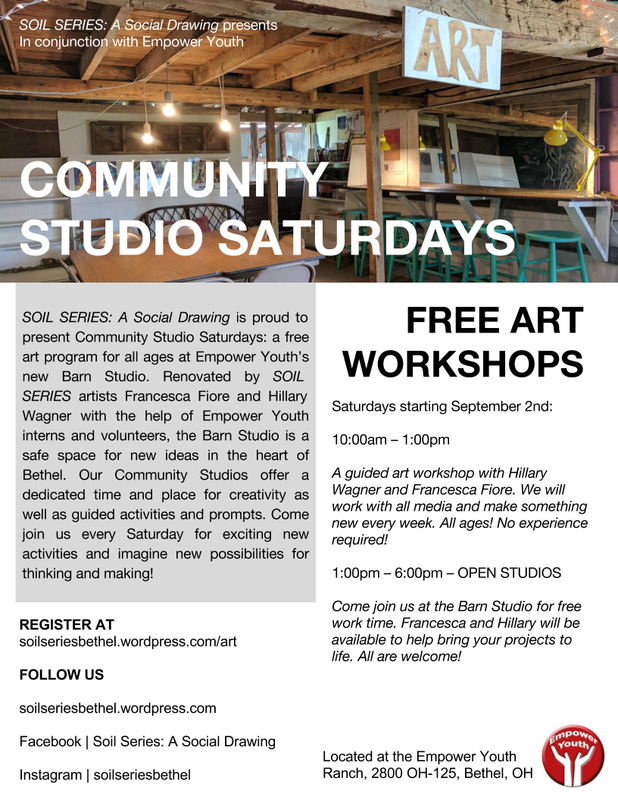 Community Studio is a free art program for all ages held in the Barn Studio at the Empower Youth Ranch (2800 State Rt. 125, Bethel, OH 45106). As part of SOIL SERIES: A Social Drawing, we are working to build a safe space for exploring new ideas in the heart of Bethel. Our Community Studio program offer a dedicated time and place for creativity, as well as guided activities and prompts. Led by the artists of SOIL SERIES, Community Studio will invite participants to broaden their definition of art and follow new pathways of thinking and making. A guided art workshop with Hillary Wagner and Francesca Fiore. We will work with diverse media and make something new every week. ALL AGES WELCOME! Come join us at the Barn Studio at the Empower Youth Ranch for free work time. Francesca and Hillary will be available to help bring your projects to life. All are welcome! Please let us know ahead of time if you plan to come and what you’d like to work on. To become part of our mailing list and receive updates on upcoming workshops and events, please contact us.